The tradition of 'Riding of the Marches' is thought to date back to the 12th Century in Scotland, when riders on horseback carried out an annual inspection of their the town's Marches or boundary stones. Riding of the Marches in Edinburgh is first recorded in 1579, and was then held regularly until 1718. The tradition was revived, for one year only, in 1946 to commemorate the end of World War 2. The event was revived again in Edinburgh in 2009, the 'Year of the Homecoming' in Scotland. 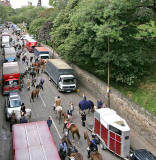 The Edinburgh 'Riding of the Marches was held on Sunday, September 6, 2009. Riders congregated at Tower Farm, Liberton, in the south of Edinburgh, at 6.40 am. They began with a ride to Swanston Village then over the Pentland Hills, and back to Tower Farm. They then left Tower Farm at noon, heading for Edinburgh's Royal Mile, via Holyrood Park. There were ceremonies for the riders at the Scottish Parliament and at the Mercat Cross in the Royal Mile. The march then continued via Johnston Terrace to the west end of the Grassmarket, and ended at King's Stables Road. Edinburgh's 'Riding of the Marches' in 2009 was oversubscribed. A limit of two hundred and fifty was placed on the number of horses that could participate. Those who organised the Riding said, after the event, that they would like to hold more Ridings in Edinburgh in future years.